Want to add that extra something to your keynotes or workshops, but aren’t sure how? Or maybe you’ve felt the panic of being asked to make last-minute changes to what you’ve practiced and prepared and would love some tips for adapting to any situation with calm confidence. 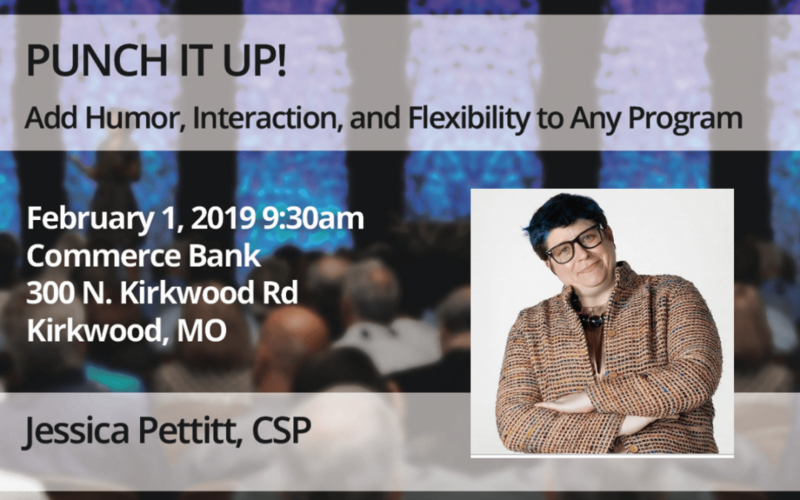 In this month’s presentation, Jessica Pettitt will share her secrets for adding humor, interaction, and flexibility to any program. Whether you have a practiced keynote or have logged miles on your Fitbit facilitating workshops, you can always punch up your content and improve your presentation experiences. Humor can help you do just that. Thinking outside the box and adding a joke or two in just the right spot can pull your message together and leave a lasting learning moment for your audiences. More importantly, when your contract calls for X and you are asked to do Y in the last moment, you can laugh it off and be prepared to shift your message’s delivery by time, format, room set-up, and even number of participants. Adding humor to your content, conversations with the planner, and “off the clock” dinners can really punch up both you and your message, leave a lasting impression, and leave you with loyal, devoted fans. Humor is a great equalizer and is often the quickest way to diffuse conflict and move toward real connection. With a background in stand-up comedy, Jessica Pettitt has the unique ability to frame even difficult subjects in an engaging and welcoming way. Audiences are inspired to stand up and take action as Jessica Pettitt leads them down the path to understanding they are good enough to make the changes they seek. Challenging long-held assumptions about the type of people who drive change and are successful, Jessica eradicates excuses and provides strategies to communicate openly and actively seek success. By moving the discussion away from daily squabbles or task-oriented challenges to a larger vision of what is possible and how best to engage people of diverse experiences, Jessica provides the context to evaluate the situation now and move forward successfully to what could be. Jessica is an NSA Certified Speaking Professional and, for more than a decade, has been educating college and university staff members to support and guide diverse students to success. Her social justice and diversity curricula are used nationwide.